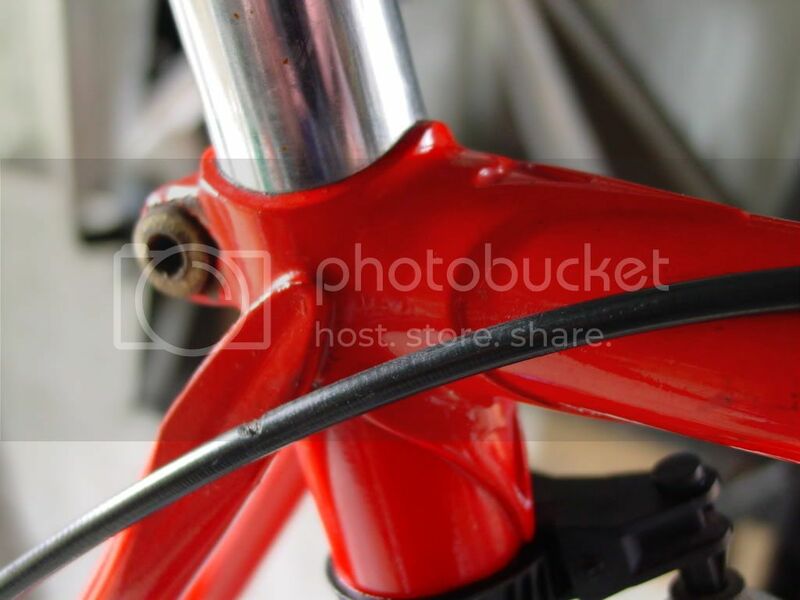 Can anyone tell me what model this is and when the frame was built? Falcon is a British company who swallowed up British Eagle, Coventry Eagle, Elswick Hopper, Claude Butler and Holdsworth and lastly Dawes. Ernie Clements was their designer and his name was used on some of their mid to upper end models. Barry Hobans name was also used on some of their bikes. 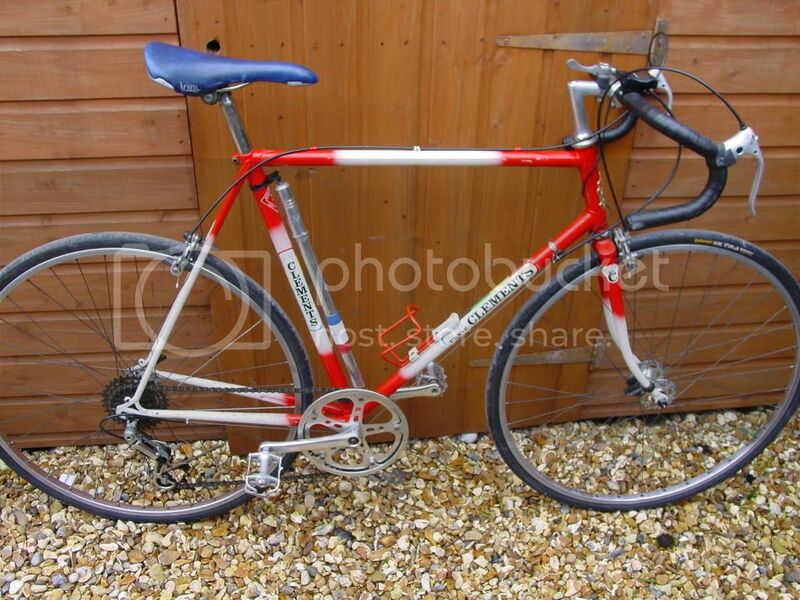 Judging by the braze on's that looks like an early 1980's to late 1980's frame. Possibly 1985 on judging by the paint job.The quality dropouts suggest a quality steel frame probably built out of one of the Reynolds tubesets. 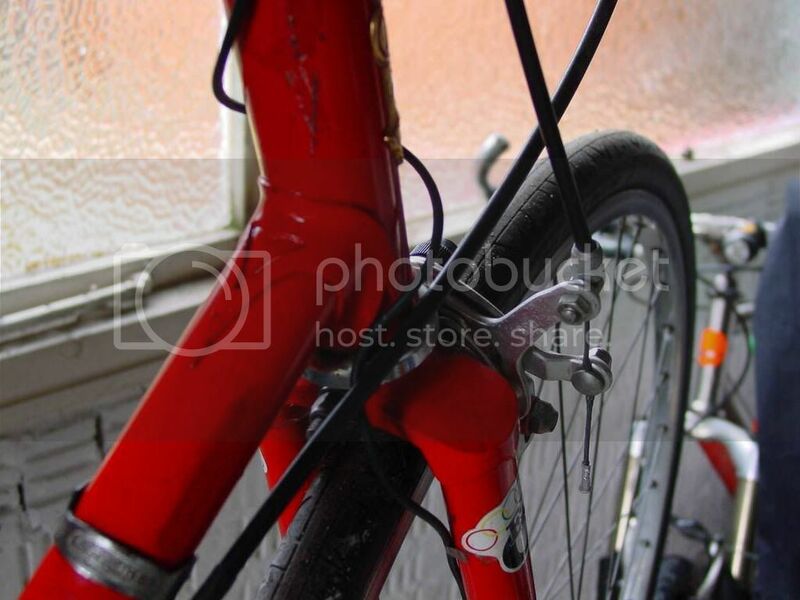 It looks like its had some newer non original parts fitted, saddle, shifter and rear mech. The chainset looks like a lower end double with the inner ring removed. I would tentatively guess that it was converted to a fixed or single speed bike before being coverted back to geared. It looks like this last conversion was done on the cheap as the mech and shifter are lowend bits. In addition the shifter is an mtb item and its placed in an unusual place, definately not done at the factory. Can you give us the frame number and details of any decals/stickers that may be on the bike, this would aid the more experienced members of the forum. It appears to have a Falcon headbadge; is that correct? It's unusual that a frame doesn't get the components it deserves, I think. Don't seem to be any tubing decals. Ernie Clements may well have retired by the time this bike was made -- wasn't he a rider in the late 40s? I attach some more pics of the frame & badge. Not sure if it's easy to see from the pics, but the fork-shoulders are distinctively sloped. Does this give a clue about age/model? Also, the brake callipers are Weinmann 500's and the casting stamp date them being made in 1979. Can't be sure if the brakes were on the original bike though! The frame appears to have been re-sprayed. I say this because the Falcon badge is glued onto the frame and not rivetted. I got this bike off a chap I worked with in the late 1980's. He had owned it for a while and I picked it up for a song (£15). This is what makes me think the frame must be much older than the '80's. My gut feeling, combined with advice from other forums, suggests it is a 1970's frame, but i'd really like someone to nail the date from the engineering. I haven't found a frame number, but it is possible it is under the re-sprayed paint. Some additional info...Weinnmann Type 500 brakes (circa 1979 off date stamp), Sachs Huret Derailleaur, cogs and chainset also Sachs, as is handlebar mounted shifter. Wheels are Mavic MA2 rims with Maillard 700 Hubs. 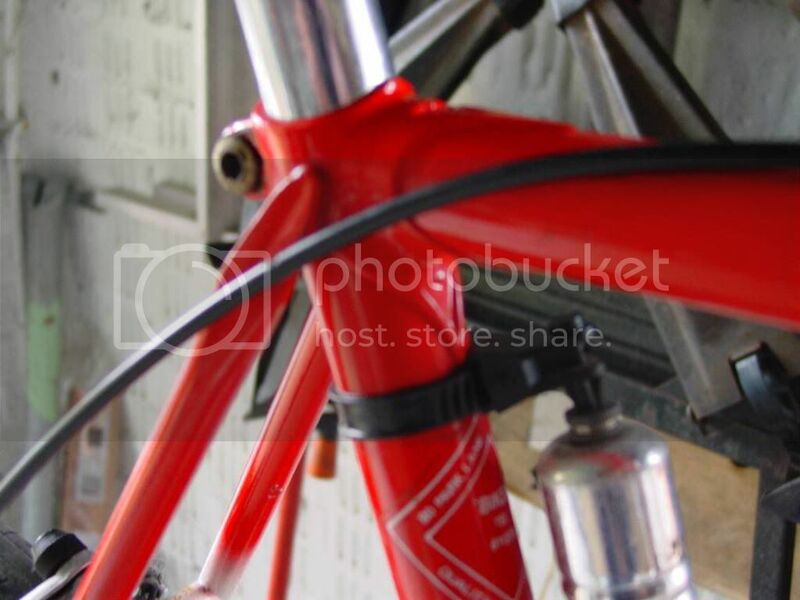 Bottom Bracket is by Baylis Willey. I was building frames for ernie for most of the 80's and this frame is from 83/84 built in Newtown Wales. the decals are not standard they were proto type Clements ones, and as for 'the rear seat-stays have a nicely crafted concave bit ' this was a cheaper version of brazed in stay ends developed by a bloke from Rhayder, powys. The frame is 531 tubing and probably built by myself or even my wife lol. She worked there also. Nice to see this one still kicking around. pS WHO DID YOU BUY THIS OFF AS MYSELF AND WIFE SEEM TO REMEMBER THIS BIKE! Last edited by boxie98; 08-25-09 at 01:15 PM. Ernie Clements had his own shop in the 50's, before he joined Falcon, and built some lovely bikes then. There were also Clements branded bikes built outside of Falcon, in the late 70's/early 80's, and the CR list guys have produced varying vague opinions about who built them (I had one, so I was interested). The most likely idea seems to be another member of the Clements family. This, however, is not either of those things. 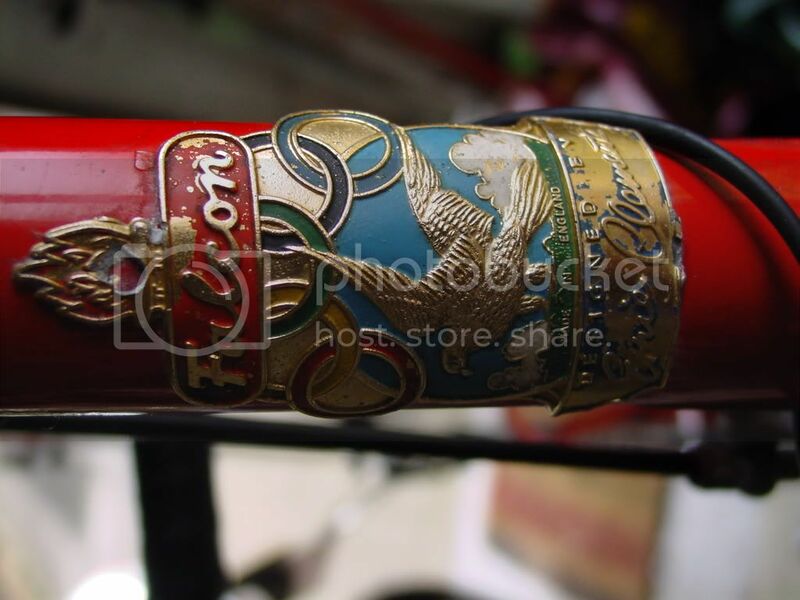 I find this post interesting, as I myself still have a Falcon that is vintage 1976 with all original components on it... Weineman brakes, Shimano crank and derailleur (Titleist), and sew up tires... I'm wondering what the value might be? Any one want to hazard a guess? Have a pic? Or know the model. We can better help you determine price. Does it have the GB stem and bars, Weinmann center-pull brakes, wrap around stay, semi-slope forks, foil or tri set Falcon Special decals? A 76 should have the metal badge. There is mid 70's for sale on Mnpl Craigs. Here is an article I wrote on Falcon bicycles that have come my way over the years. The '76 and the '80s model above have very little in common, to my knowledge. I just recently got a early'70 falcon. Can anyone help Identify it? Did the earlier models not have wrap around seat stays? Why put such nice finish and fittings on a pipe frame? 1980s Japan.